Nothing comes easy to my hometown of St. Louis. Just as the town was reveling in its World Series victory comes the news that St. Louis is the most dangerous city in the U.S. As my people say, "Oy Vey." The statistics don't include the leafy suburbs where I was raised, but still. I love the city of St. Louis, which passed its heyday, oh, about 100 years ago. It boasts spectacular early 20th Century architecture, and the people there couldn't be friendlier. Except for the ones committing all that crime, of course. When I head home for Thanksgiving, I'll give thanks for baseball miracles and say a prayer for safety on the streets ... of my little town. 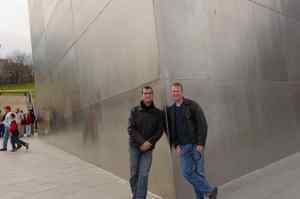 Note: Shot is me and my friend Danny at the base of the Gateway Arch. Yesterday I visited the absolutely amazing de Young museum in San Francisco's Golden Gate Park. After suffering damage in the 19889 earthquake, the museum was completely rebuilt and opened earlier this year. 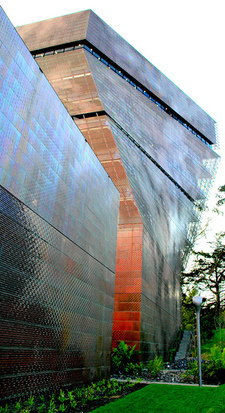 The Swiss architecture firm Herzog & de Meuron and Fong & Chan Architects in San Francisco designed it. It was too beautiful a day outside for anything but a quick glance at the impressive art. But the museum itself is phenomenal. Here's a review from architecture blog Tropolism. Next time you're in SF, make it a must-see. 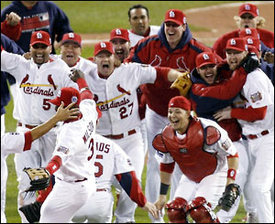 Congratulations St. Louis Cardinals, for your pull-out-the-stops World Series victory... for being champions more than any team but the Yankees ... and for making my homeown family very very happy. From today's NY Times: " The fans here are patient. They are adoring and savvy and upbeat, too, but mostly patient." Well ... I got the adoring, savvy and upbeat part. But patient? I guess that's why I had to move to New York. I'm flying to San Francisco today, for a week of work on a new business venture. Very excited. CU, SU and B6. Have fun. I had dinner tonight with San Francisco culinary maven Sean Timberlake, creator of the foodie blog Hedonia. If you're headed to the Bay Area, check in with Sean before making dinner reservations. I felt the need to come up with a noteworthy Manhattan dining experience given the food snobbery of most San Franciscans. So I took Sean to Tia Pol, which is truly one of the great Tapas restaurants in the U.S. Conveniently, it 's also about half a block from my apartment. If you live in New York City, by all means go. If you're visiting, put it on your short list. But remember: Tia Pol is teensy weensy, and they don't take reservations. Get there as close to opening as possible. And order the garbanzos fritos (fried chick peas). At $3, it's the best appetizer in NYC. Last week Brown University (my alma mater) released a university-sponsored report Brown's links to slavery. It found that 30 members of Brown's governing board owned or captained slave ships and that the Brown family owned slaves and engaged in trading. Here are the details. Sobering findings for such a liberal institution. When I arrived in Providence as a freshman, one of the things that totally freaked me out was when people from the east coast asked me "What's it like coming from the South?" The South?!? When did St. Louis become part of the South? I was sensitive about this question because to me – at 18 in 1979– the South meant racism and bigotry and Southern drawls. St. Louis was the Midwest, land of homespun, all-American values. But the reality is – then and now – that every corner of the U.S. is populated by people who dislike those who look or act differently from them. What can we do about it? Start by celebrating your own uniqueness, stand up for equality whenever you can, and vote for candidates (on November 7) who walk the walk when it comes to equality and justice. The wreck on the left is the famed Pavilion dance club on Fire Island Pines. I snapped the shot this weekend. The Pavilion was one of the gay world's most infamous dance clubs. From the gay heyday of the 70s through the highs and lows of the past 25 years, The Pavilion is where the amazing gay community of the Pines gathered to socialize at "High Tea" ... and to dance the night away thereafter. The stories this dance floor could tell are legend. This black and white shot shows the club at its sweaty peak. The chandeliers never fell. 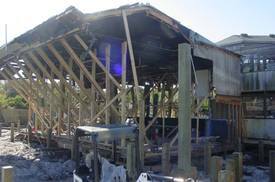 Still, the Pavilion was always kind of a mess, and its new owners are building a replacement for a new era. Personally, I thought it silly that they didn't have a demolition party, or something to celebrate the incredible memories of the place. A Pavilion Follies, if you will. But I'm hopeful that whatever takes its place will house the same spirit of fun, decadence and community of the original. See you next summer. In honor of the opening this weekend of "Running with Scissors," I am posting a picture of me and the author of its book, Augusten Burroughs. I am in the middle with the bad hair and scary shorts. Augusten is ... the other guy. The picture dates from 1990. The occasion is a commercial shoot for American Express. The location is Black Sand Beach in Hana, Maui. I was the client. Augusten was the copywriter for Ogilvy & Mather. Strangely, there was not one word of "copy" spoken during the commercial. It was visuals and sound effects only. We had a great time. We spent $2 million. And the commercial never aired. A few years later, I'd become a minor gay celebrity entrepreneur. A few years after that, Augusten had become a mess, and then a major gay author. I bumped into him once about 6 years ago. I hope to again soon. 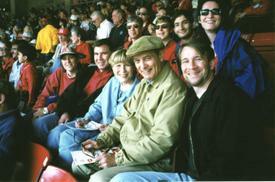 This not entirely flattering picture (circa 1999) is of me and a lot of my family. 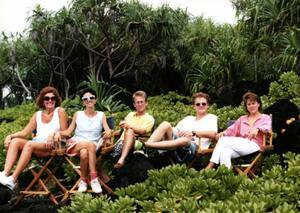 It includes brothers Ed, Rich and Daniel, sister Sibyl, sis-in-laws Steph and Bettina, and Mom and Arnold. Yours truly, of course, is mugging front and center. The important this is that we are all sitting at Busch Stadium, watching a St. Louis Cardinals baseball game. Yesterday the storied Cards pulled off an unlikely victory against the New York Mets, and advanced to their gazillionth World Series. When you live in New York, a loss (or win) like last night is a blip on the radar. When you live in a place like St. Louis, a hometown sports victory is a singular event ... one that pulls everyone together in a communal spirit of joy, or disappointment. I'm not a big sports fan. But I grew up in one of the truly great sports towns, where fans are deeply connected to their teams in a warm, spirited way. So off to Detroit it is. Play ball! It Ain't Oz. It's Ozark. "Ozark" is a weird sounding word. It sounds even weirder the more times you say it. 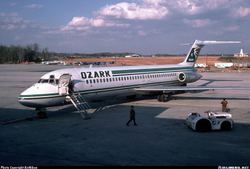 This is a picture of an Ozark Airlines aircraft, circa 1983. The airline flew from 1950 to 1986, when TWA purchased it. 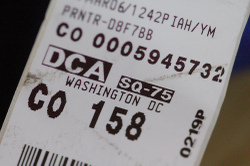 Funny enough the airline code for Ozark was ZO, not OZ. Because I grew up in St. Louis, I flew Ozark a lot. 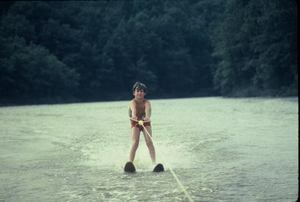 In honor of my random Ozark Airlines reminiscence, I also present you with a picture of me water skiing at the Lake of the Ozarks, where we had a summer house when I was a kid. Good God. That is the saddest skiing form I've ever seen.